"The worst enemy of the Tama river is cormorants – they have wiped out fish populations"
Yoshinori Mizutani is known for his over-saturated colour photographs that grace the pages of his two most popular photobooks: Tokyo Parrots (2014) and Colors (2015). In fact, these publications were such a success that he recently did an assignment for the New Yorker on shinrin-yoku (forest bathing) and his work from Parrots was featured on a range of men’s clothing by the fashion designer powerhouse Issey Miyake – seriously. But it is Mizutani’s darker work that attracts me, and especially the contrast and thematic juxtapositions this establishes. This, to me, is reflective of Japan and especially Tokyo. I think of Shinjuku (my spiritual home) where on the south-east side is located the extremely picturesque Shinjuku Gyoen (National Garden) and a ten-minute walk to the south-west is Kabukichō (the entertainment and red light district). HANON (2016), Mizutani’s latest publication, delivers this darker side of Japan in graphic style. 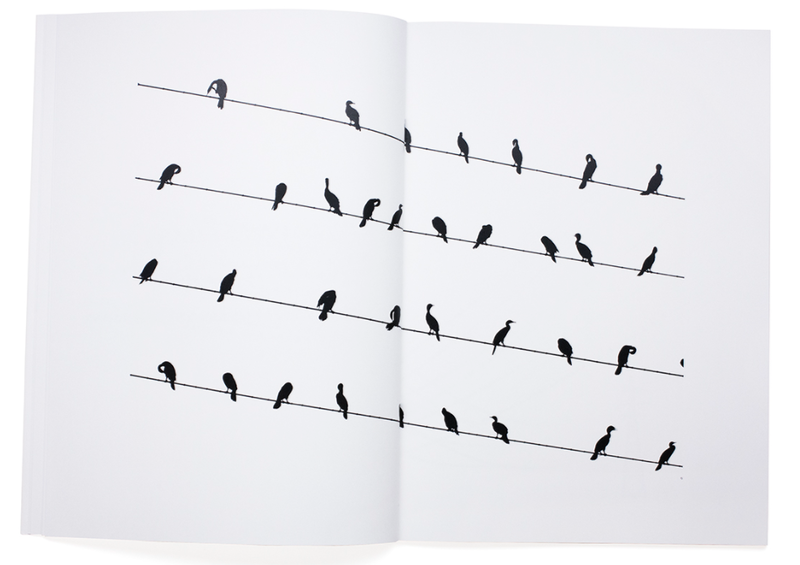 The book features a series of stark B&W images of great cormorants in flocks or perched solely amongst the maze of power lines that dominate the Tokyo skyline. These silhouettes are precariously edited throughout the book and resemble a musical score. This has not gone unnoticed by Mizutani (or publisher IMA) as the title HANON is a reference to the French piano instruction book titled Hanon Complete: The Virtuoso Pianist in Sixty Exercises for the Piano by Charles-Louis Hanon. As with many Japanese photobooks, it is the subtleties that make this publication function so well. The pages are printed on rather thick stock but the deep black ink makes the following page slightly visible while leafing through the pages, enmeshing and creating further compositional complexity. The starkly contrasting pictures differ through a set of prescribed sizes and each image is meticulously printed. So much so that, although the whites seem to bleed into the page and disappear, the actual white surface and especially edges of the frame are distinguishable for those who look close enough – white on white punctuated by black. Interestingly, in the short text included in the back of the publication and through my own research online, there is no mention of Fukase and his ravens in relation to this project? Note to Mizutani-san: although there is only one copy of Taxi Dirty Book ‘at hand’ I would love to see it – let alone – acquire a copy!